Aberdeen, Scotland is a city located between the River Dee and the River Don. Exposed Aberdeen is noted for its biting winds and driving rain, which sweep in from the North Sea, the mean temperature is 8 °C (47 °F) and it varies between an average low of 5 °C (41 °F) and 11 °C (52 °F). In summer (June - August) the average high is 16 °C (63 °F) and average low 9 °C (49 °F). In winter (December - February) the average high is 6 °C (43 °F) and average low 0 °C (32 °F). The average yearly precipitation is 753 millimetres (29.7 in), with 64 millimetres (2.5 in) in summer (June - August) and 62 millimetres (2.5 in) in winter (December - February). The wettest months are October and November. Education: Educationally Aberdeen has a higher student rate than the national average of 11.5% compared with 7% nationally. Household: In the household, there were 97,013 individual dwellings recorded in the city of which 61% were privately owned, 9% privately rented and 23% rented from the council. The most popular type of dwellings are apartments which have 49% of residences followed by semi-detached at just below 22%. Income The average income of a household in the city is £16,813 (2005) which places about 18% households in the city below the poverty line (defined as 60% of the mean income). Population: In 1396 the population was about 3,000. By 1801 it had become 26,992; in 1841 it was 63,262; (1891) 121,623; (1901) 153,503; (1941) 182,467. In 2001 it UK census records the Aberdeen City Council areas population at 212,125, but the Aberdeen locality's population at 184,788. The latest official population estimate, published by the General Register for Scotland for 2005, is 202,370. The population density of Aberdeen is 2819 persons per square mile (1,089 km²). Data from the Aberdeen specific locality of the 2001 UK census shows that the demographics include a median male age of 35 and female age of 38 which are younger than Scotland's average and a 49% to 51% male to female ratio. It also showed that there are less young people in Aberdeen, with 16.4% under 16, opposed to the national average of 19.2%. Ethnically, 15.7% were born outside Scotland, higher than the national average of 12.9%. Of this population 8.4% were born in England. 3% of Aberdonians are considered to be from an ethnic minority (non-white), with 0.7% from the Indian-subcontinent and 0.6% Asian. Religion: The last census revealed that Aberdeen is the least religious city in Scotland, with nearly 43% of people claiming to have no religion. 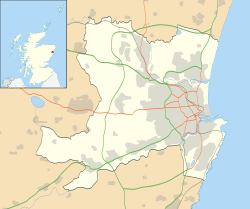 Aberdeen extends to 71.22 square miles (184.46 km²), and includes the former burghs of Old Aberdeen, New Aberdeen, Woodside and the Royal Burgh of Torry to the south of River Dee. The city is built on many hills, with the original beginnings of the city growing from Castle Hill, St. Catherine's Hill and Windmill Hill (also known as the Gallowgate). ^ Aberdeen City Council. "Low Income Households in Aberdeen". Retrieved 12 March 2007. ^ "Aberdeen Population". Retrieved 19 February 2007. ^ a b "Comparative Population Profile: Aberdeen City Council Area, Scotland". Archived from the original on 27 September 2007. Retrieved 21 February 2007. ^ a b c "Comparative Population Profile: Aberdeen Locality, Scotland". Archived from the original on 27 September 2007. Retrieved 21 February 2007. ^ General Register for Scotland. "Land Area and Population Density" (PDF). Archived from the original (PDF) on 14 June 2007. Retrieved 12 March 2007. ^ a b c d Aberdeen City Council. "2001 Census: Key Statistics - Aberdeen City". Archived from the original on 27 September 2007. Retrieved 28 February 2007.